New Ulm’s Way of the Cross was completed in 1904 and renovated in 2004. Its 14 stations, with statues imported from Bavaria, provide a quiet, reflective walk up a gentle incline to a chapel dedicated to the Mother of Sorrows. 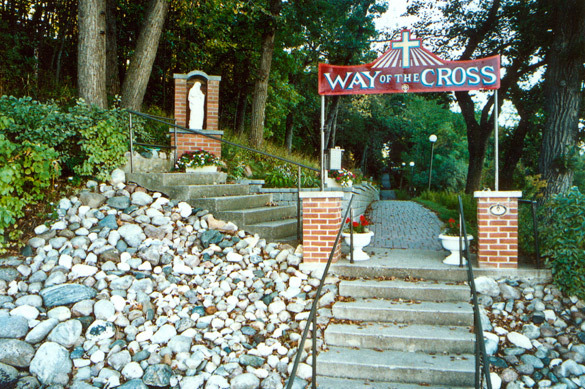 Entrusted to the Diocese of New Ulm, the Way of the Cross is located on the 5th North hill, behind the New Ulm Medical Center, and includes a nearby memorial to Father Alexander Berghold, an instrumental priest in the 1800s who initiated the project along with Sister Flavia of the Poor Handmaids of Jesus Christ. Hours: Daily from April to October (Chapel open). Don't mind the snow and cold? Take a walk and explore this attraction in the winter, too (Chapel at the end not open in winter months). The statuary in the Way of the Cross stations have been removed for repair and repainting. They will be returned in Spring 2019.